Deep-fried frogs' legs (椒鹽田雞腿) - more things to nibble on,,, and easy to grab with my fingers. Very yum. Roast suckling pig (大紅片皮乳豬) - as good as it's ever been, with that wafer-thin crackling. Oh and the other parts of the pig were yummy, too. Tonight the ribs weren't over-seasoned, and the neck was nice and marbled. Double-boiled soup with winter melon and duck (冬瓜火鴨湯) - we wanted winter melon soup (冬瓜盅), but were told that they had just sold out of the last one. When we subsequently asked what the soups of the day were, we were then told that this was available... Anyway, this was very good. I particularly liked the pork belly that was also used in the soup, and in fact couldn't help but eat a few of the pieces... with the fat and the rind. Hairy gourd with conpoy (瑤柱節瓜) - pretty simple comfort food, but very homey and satisfying. Fook Lam Moon's famous crispy chicken (當紅炸子雞) - never had cause to complain about this here chicken, and tonight the pieces I took were very moist inside that amazing crispy skin. Yolk and sesame paste birthday buns (蛋黃麻茸壽飽) - well, it's a birthday celeberation so you can't do without these birthday "peaches" (壽桃). We ordered both types of fillings, but everyone (except for the guy who was too slow) went for the sesame paste version instead of the more common lotus seed paste variety. I was really full, so I passed on the other desserts that the gang ordered. I had already taken in way, way too many calories for the day. 2005 Kistler Chardonnay Kistler Vineyard - took out 2 bottles of this baby. Very ripe on the nose with some lemon citrus, and good amount of oak. Ripe and sweet on the palate. 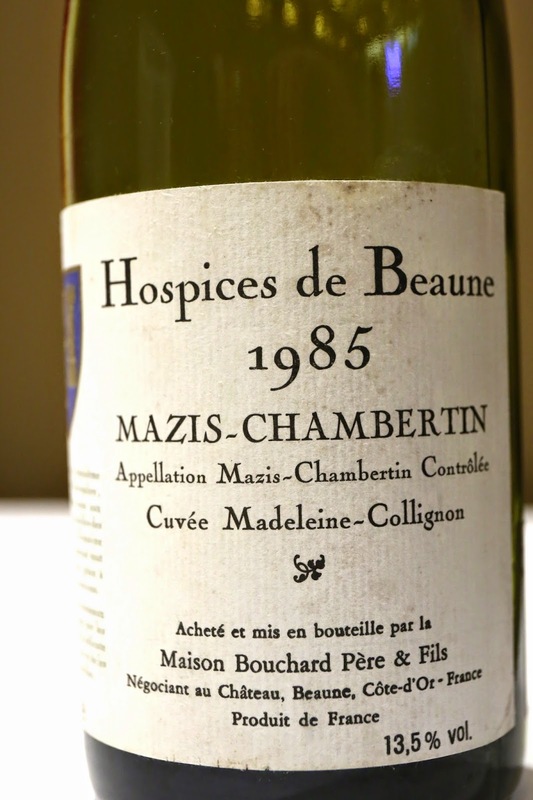 1985 Hospices de Beaune Mazis-Chambertin Cuvée Madeleine-Collignon par Bouchard - opened up two of these and decanted them just before serving. Very ripe on the nose, with plenty of stewed prunes, a little forest, and a little salty plum. Clearly getting a little tired. After extended aeration the palate died pretty badly.